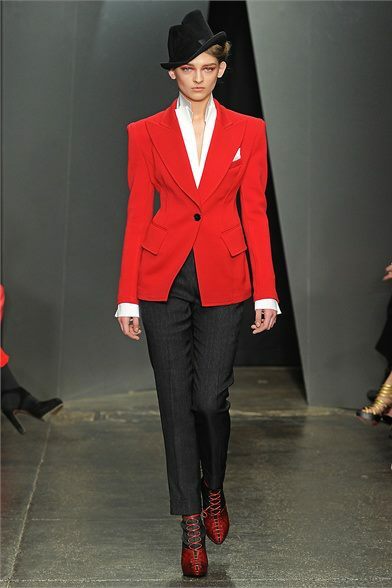 Donna Karan fall 2012 / winter 2013 collection features the 40’s in a contemporary version of old world glamour. A master of elegant draping, she kept the show alive and awesome with a play of subtly curved and strutted dresses in such quite strictly arranged and awe-striking draperies. Here comes the girlie nature in a dusty pink frock with dainty elbow gloves, classic string of pearls on the neck and a skinny belt that holds the drape. Yes, dusty made out most of the hues in the collection with nice taupe, pretty pearl grey, mild beige, plain slate, soft cream, sweet rose, smooth terracotta and, a little bit of charcoal silhouettes. Many collections throughout the globe also feature vintage elegance, as it is, for a designer, a dramatic, romantic, and enchanting moment to relive the past and give it a modern twist. There’s nothing more fascinating than styles of the past being revolutionized with emerging ideas that come from who knows where. As long as a designer is inspired, there surely is a lot to do. Take Donna Karan’s many years of coming up with fresh, gorgeous and magnificently constructed designs, for example. She thinks ahead of what should or what should never appear in her collection. But she does it naturally, like a true genius of fashion. It’s easy to say she could be the Miuccia Prada of New York, yet, no, she’s way more than that. Donna Karan is a born artist, a living legend, and demigoddess for urban dressing. No one ever does it like her. No one ever will.